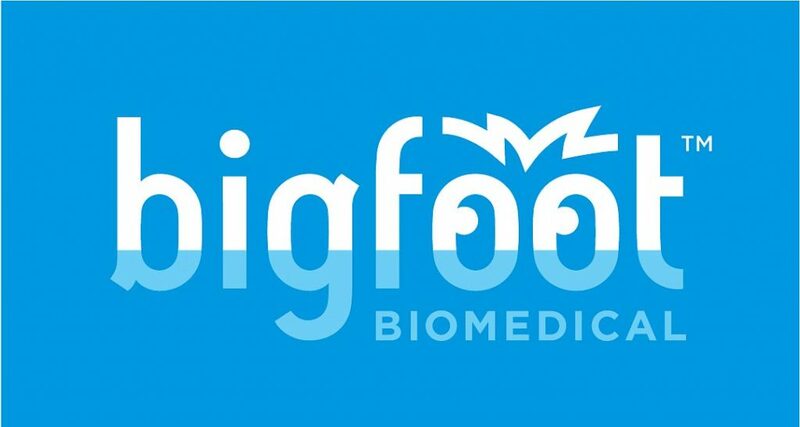 For years Bigfoot Biomedical has been touted as a champion of bringing closed-loop insulin therapy into a commercial product. They were formed in 2014, and are continuing to work towards introducing a product (they plan to support both pumping and MDI with their technology). They remain an interesting entity to watch, although there are also a bunch of other players emerging in this field. In 2015 Bigfoot acquired the pump manufacturer Asante, and the Asante Snap pump provided them with a pump platform of their own so they could concentrate on the looping side of things without having to develop that hardware from scratch. For some background reading, have a look at Melissa Lee’s 2014 review of her Asante Snap. The pump is comprised of two parts that clip (“snap”) together. 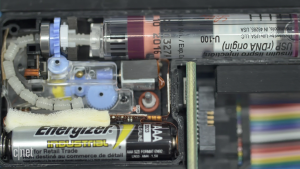 A pump controller, and a disposable pump “body” which essentially contains the motor and sensors, a 3ml insulin pen cartridge, and a connection to the infusion set tubing. Some more commentary about the pump can be found in Gary Scheiner’s 2015 post. A recent CNET article talked about Bigfoot’s plans. In it they show photos of the current experimental device, which is very much still a Snap (just with a different label). Presumably the pump controller component has had a major overhaul by Bigfoot, but from the look of things the body component is almost unchanged. The infusion sets they’re now using are the Orbit sets which I’ve written about previously. The insulin supplied in Asante pumps was initially Humalog, with talk of later introducing Novorapid. The photos of the Bigfoot device show a Humalog cartridge, and presumably the Novorapid plans are “still coming”. For Novo PenFill cartridges the housing for the cartridge will need to be a slightly different size, and due to the diameter change the cartridge delivers a slightly different dose for the same physical advance of the plunger, so the motor will need a different calibration. A notable point about the pump is that the body is disposable (it doesn’t seem to have a rewind function or easy access to the battery). You’re expected to use a new pump body with each 300U of insulin. That throws away the housing, the motor, the alkaline AAA battery that powers both the body and the controller, etc. This seems “quite wasteful” (even if it does remove issues of battery supply/choice). Part of Bigfoot’s plan has always been to create a new simplified paradigm of delivery to patients, and all their talk of this has been centred around how they can work with insurers (“payers”) in the US market. The US insurance market is different from most of the rest of the world, and at the moment it’s hard to imagine how this product could be delivered effectively outside the US. Certainly it’s hard to imagine how this would fit the prostheses funding model used for insulin pumps in Australia. Definitely it would require a paradigm shift. Suddenly the cost of the consumables becomes significant compared to the cost of the durable controller. The OmniPod pump from Insulet is in a similar situation. Each disposable pump contains the cannula, battery, motor: everything except the wireless “PDM” (Personal Diabetes Manager) controller device. In fact its reservoir only holds 200U. Every time you need to refill, you need a new pump. The OmniPod received TGA approval back in 2010, but hasn’t made it to the Australian market. The economic reasons behind that are clear. 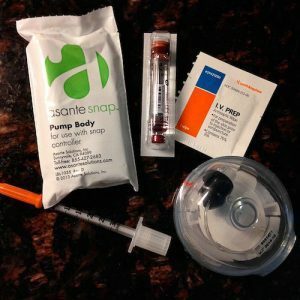 This would need some new funding model to support the cost a new pump at least once a week (the frequency will depend on the insulin requirements of each person). In many cases several per week. Cannulae should be changed every 3 days, but when the cannula and pump body are separate (as in the Asante and most other pumps) these can be changed at a different frequency to the reservoir. In the current funding model anyone can buy a pump (or get their private health insurance to buy it for them – the usual path) for between $7362 and $9025 (depending on the model) and then access the consumables with government subsidy via NDSS. For a box of 10 infusion sets or 10 reservoirs (each nominally lasts a month, depending on the person) we pay on the order of $17, although the cost to the government (or to private purchasers) will be about ten times that. If the cost of the consumables goes up dramatically from that (due to including batteries, pump mechanisms and circuitry, etc) it’s unlikely that the NDSS system could fund the increased cost. Let alone the issue of increased waste. The OmniPod certainly hasn’t managed to fit this funding model in the last 9 years. It would be interesting to see what the cost of a box of 10 Bigfoot pump bodies would end up being. Keep in mind that a box of Orbit infusion sets would also be required.